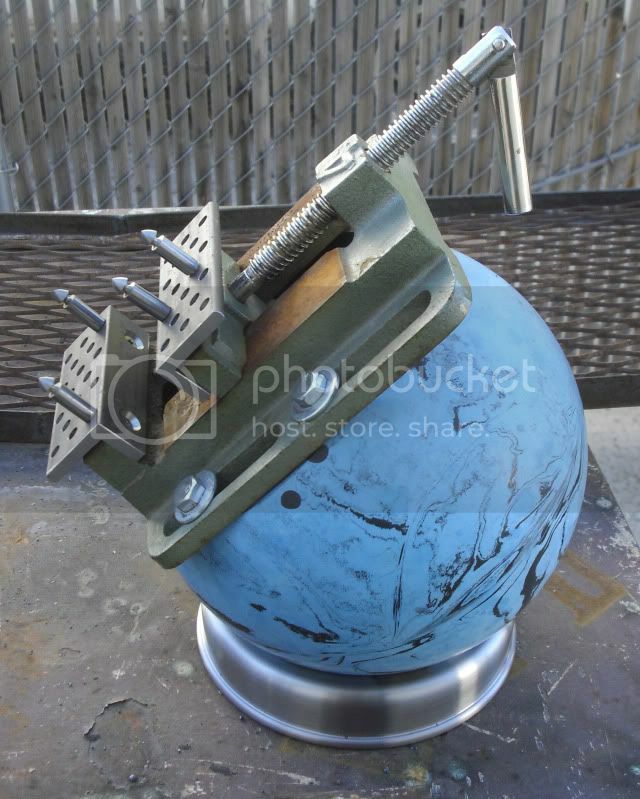 I decided it's time to build me an engraving vise. This had to be done on the cheep! 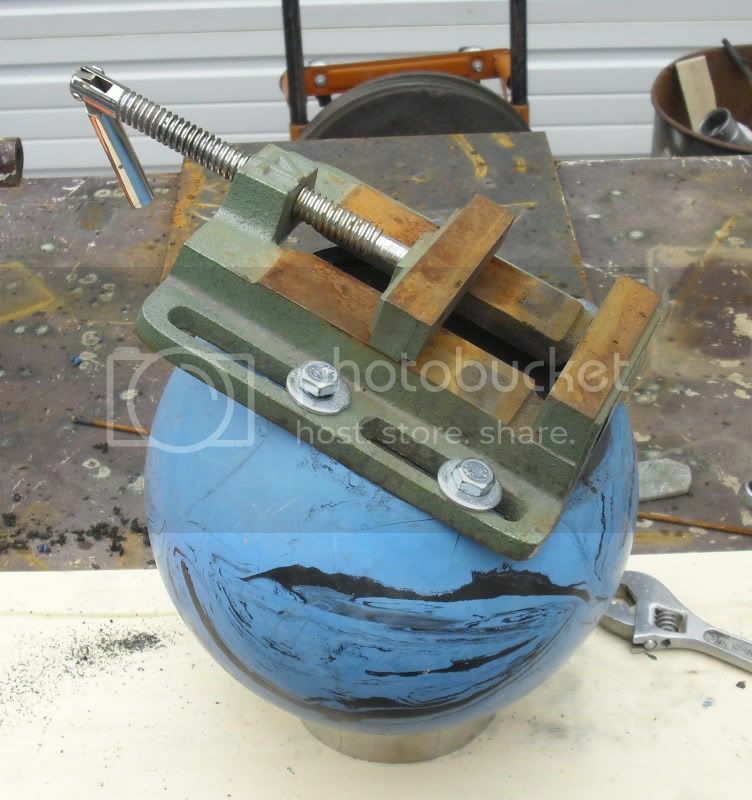 I looked around my shop and came up with a blue bowling ball and a Harbor freight vise. I spent a good part of my free time today trying to come up with a easy way to cut off a slice of this ball on my bandsaw. I ended up just strapping it to a board with a ratchet strap. It worked perfect!!! I cut off what looked like the right amount. Bolted on a cheep drill press vise I had lying around and presto-chango!!! I have a fancy engraving vise. I still need to find a bigger doughnut for it to sit on. But I think it will work out great!!! It is one of the Harbor freight swivel vise with the suction or clamp base. I also have an aluminum natural finish one from our US aldi's version. I just enlarged the one hole to slip press fit the vise shaft. You can put the inner tube in the tire and adjust the air pressure to make it easier to move the tire. That is also one of the HF wheel/tire 10" size with the wheel removed. Mr Powder you never cease to surprise with your cheap and 'out of left field' ideas. Don't stop as many of us like that method and helps us to think 'outside of the square' as it were. Thanks for the compliments. It's nothing that hasn't been done before. I just showed how I made mine. I found pictures on the internet and went for it. I'm making some pin jaws so I can hold irregular stuff as well. Pictures when they are done. I finally got back out into my shop! We had our sewer line quit working on us and I couldn't afford to have it fixed. So I ended up doing it myself, with the help of some good friends. What a job!!! 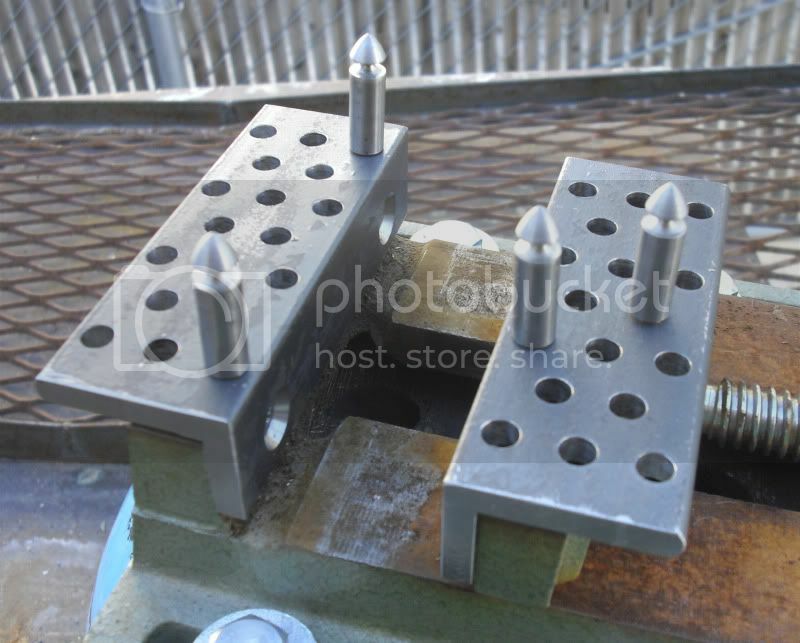 I made some pin jaws and pins for my crappy vise. I also turned up a base out of a scrap piece of tube. All the kit and no clue! That is a fantastic recycling project! Just because i can't, doesn't mean i shouldn't? Tool- lover, with a collection to show for it!